The heritage from legends like Led Zeppelin and the 70's heavy rock sound is carried on by a band from Austin, Texas. 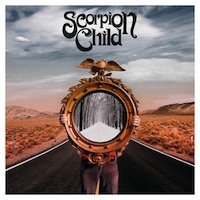 Nuclear Blast Entertainment will release Scorpion Child's self-titled, full-length debut. The albums is produced and arranged by Chris “Frenchie” Smith (The Answer, Jet, And You Will Know Us by the Trail of Dead, The Toadies, Dax Riggs). The album uses analogue recording technology to organically capture a hybrid of nine, hook-filled chapters of heavy psych rock. The vocalist Aryn Jonathan Black is fronting the band and does it with a voice at Robert Plant levels! I've never heard someone who has so similar voice mode to Mr. Plant before and combined with this extraordinary band, we are presented with an amazing ear-experience. If you like bands like Witchcraft, Free Fall, Clutch, Orange Goblin and Graveyard this a given purchase! The groovy and heavy sound is very juicy and a old hard rock head like me will enjoy every minute of these nine tracks. It sounds like they have done millions of albums, but this is the debut and how in the hell will they make anything better that this?? The blend of the faster, high technical rock n roll tracks and the slow blues heavy rock songs address me. This is one of those discs that I want to have in my car, Ipod, Mac, everywhere! Scorpion Child makes me want to get an overgrown beard and mustachio, get longer hair and start to wear my old suede jacket with long fringes again! I'm back in the 70's! I have to give the phantom on the drums; Shawn Paul Alvear a special attention because the drum playing is just amazing throughout this album. The lyrics are awesome, the vocals are stunningly clear and high pitched and the wonderful back-to-basic hard rock tunes are so damn refreshing to listen to over and over again.